Do you have a favorite dish you eat out, but never make at home? That was Spinach Artichoke Dip for us. We loved having it out, but I thought it would be hard to make. I was completely wrong, it’s so easy and makes a great party food. Last year I finally made it for Christmas Eve and it was a huge hit. 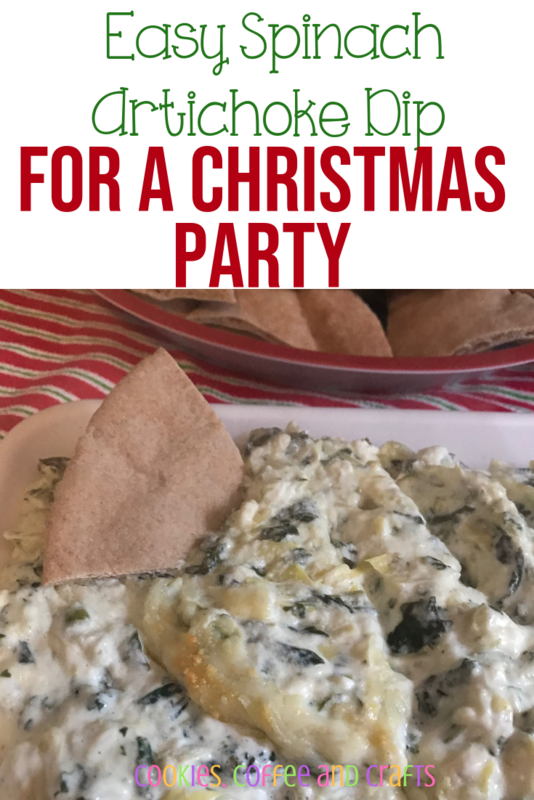 Spinach Artichoke Dip has now become a Christmas Eve tradition for us. 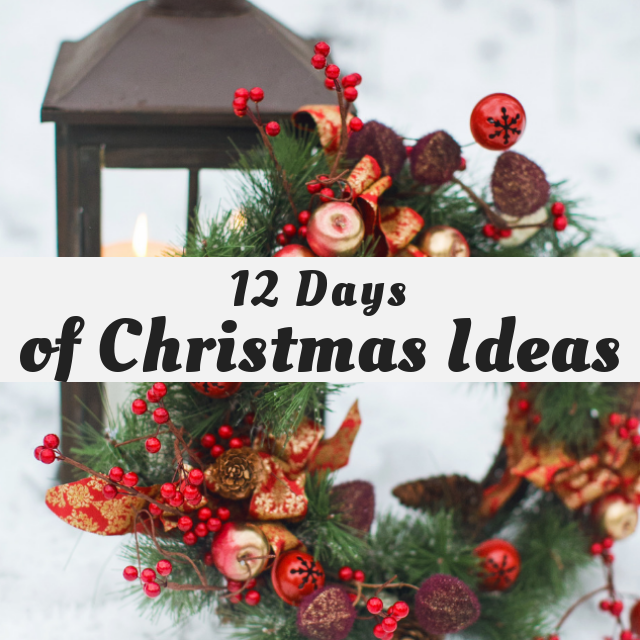 If your just too busy or overwhelmed to cook for a party, here are 3 Christmas Party Foods for a Busy Mom , just add to a cute tray! Everyone asked for the recipe and wanted to know all the details of how I made it. You know something is good when everyone stays around the table to have some. It’s always nice to feel you have impressed your guest. A funny story about making this, is I found out spinach is very very very popular at Christmas time. This was a surprise to me and I couldn’t believe it when the shelves of frozen spinach were empty at the grocery store. I even asked for help, like maybe it’s on display or something and I missed it, the employee just laughed and told me they had been out of spinach for days. A couple stores later I did finally find some, so this year I planned ahead and already have my spinach for Christmas. 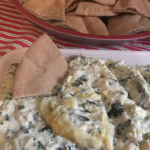 Spinach Artichoke Dip can be good with so many things- bread, chips, crackers or veggies. Choose one for the party or choose a variety. My favorite is with pita bread. When my sister visits, us girls (my mom, sister, and me) go to a local restaurant and have this dip. 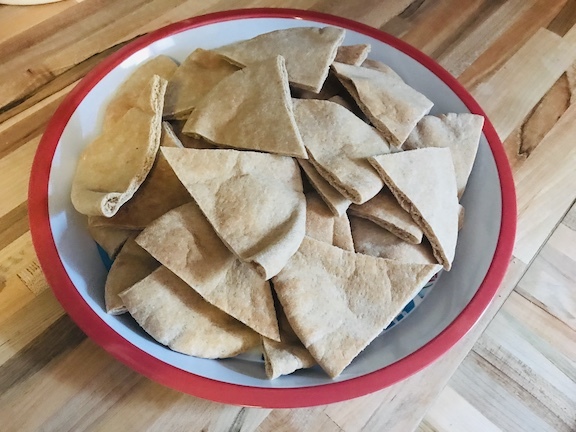 They serve it with warmed pita bread and it’s so good! It’s a great time to snack and catch up. Just follow the recipe and instructions and you will be in food heaven! It’s easy and great for busy moms to prepare. 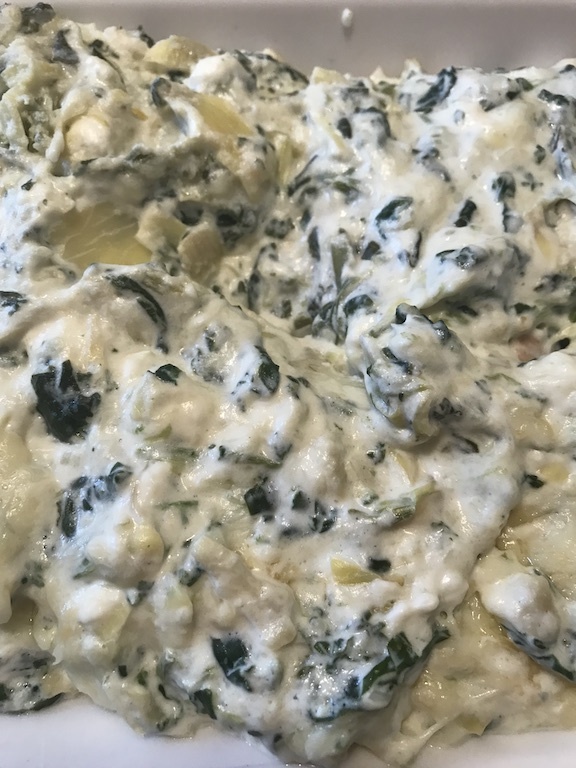 Make sure you remember to take out the cream cheese to soften and the frozen spinach to thaw so you can make the dip. 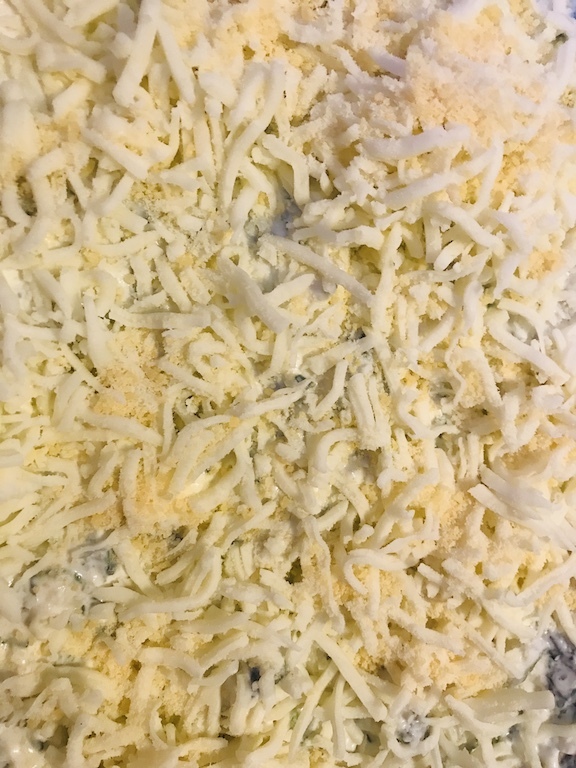 I like to sprinkle some parmesan cheese on top before I put it in the oven. Then just measure, mix, and bake! Drain and Chop the can of small artichoke hearts. Mix 1 1/2 cups of cheese mix, spinach, artichokes until combined. Next add garlic, cream cheese, yogurt, and mayo into the spinach mix. Pour into an 8x8 baking pan. Top the dish with 1/2 cup of cheese mix and sprinkle a little parmesan cheese on top too. Bake 25-30 mins until the cheese is golden and bubbling on the top.